What do all these movies have in common? They all featured one of the actors from National Theatre Live’s recent presentation of Hamlet. I know, when most people think about the works of William Shakespeare, they let out a groan. In their minds, they see prim and proper actors like in those old movies we saw in our English Lit classes (if they aren’t simply stuck with an image of the words jumbled together on the page as they struggle to find meaning in those words). I understand it, to a point. The old style English can be challenging when you aren’t used to it and a lot of people find the old black and white movies cheesy these days. At the same time, who isn’t at least a little familiar with some of these great lines from this play? While I am not like one of the people I mentioned above (I quite enjoy reading Shakespeare and have no difficulties sitting down to an old black and white classic), I think that seeing a play at your local theatre will open your eyes to the masterworks of The Bard. [John] I’m a huge fan of Shakespeare myself though I have not a drop of the dramatic ability that Lana holds and I cannot remember lines and character names in the same way. Despite this, there is magic within the world of Shakespeare and the privilege the audience is granted to watch and to enter that dynamic if for a brief few hours, is emotional, confusing, wonderful and exhausting. It can be compared to nothing. [Lana] Let’s take the name Shakespeare out of the equation for a moment. Picture, if you will, the son of a king who was murdered by his own brother…the brother then marries the son’s mother to become the new king. Enter the ghost of the fallen king to spur on the son to avenge his death; friends-turned-spies, madness, treachery and more murder. It is a movie anyone who enjoys action films would love. Now add Ciaran Hinds who is no stranger to playing the villain. 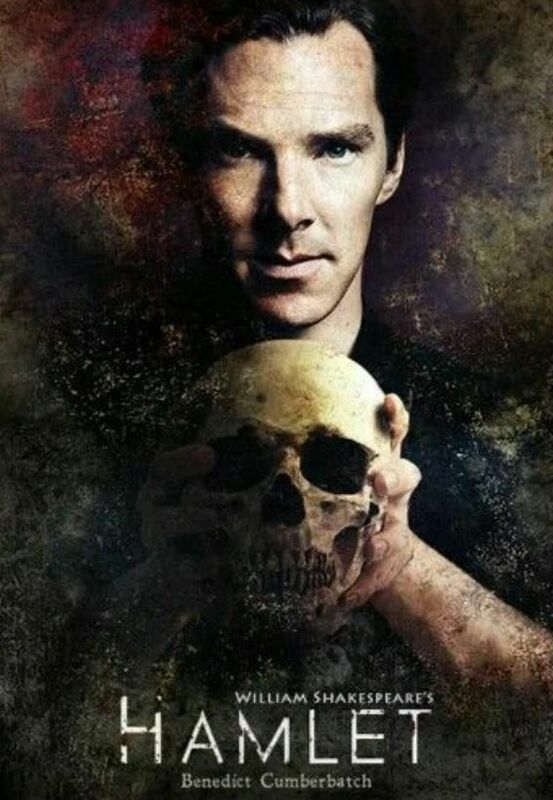 Add one of the hottest actors today in Benedict Cumberbatch to play the lead to perfection, and you have a blockbuster in the making…and it was written by William Shakespeare. I am not going to say that the performance is for everyone but I would implore you, if you have never seen the play live, give it a chance. Who knows, you may just be surprised. [John] You know, I’ve honestly never thought about it in that way. I have never placed one of his plays in a different light. I suppose I’ve never felt the need to look at Shakespeare from a perspective other than it simply being Shakespeare. What sense it makes to look at it as a story separate from the author. It really is just a story… a plot with characters that experience joy and loss and anger and success. Yet the name Shakespeare does instill a sense of fear and dread in so many people. I was in grade six when I first read Hamlet. At eleven years old I know I did not grasp everything but I also know it hooked me. Hamlet was my first Shakespeare experience and it stuck. How many times I’ve read the play, I have not a clue. I’ve only see it performed maybe six or eight times and I’ve never been touched by its performance the way I was with this particular cast. [John] Hamlet made me cry this day. A performance so intense - so riveting that Lana was on the edge of his seat for most of the time and I cried. This presentation of plot and human ability brought everything together for me and I gained a new understanding of the story. I don’t remember another performance allowing the words to form their own meanings and the pauses drawing their own breaths. I made an emotional connection and it sparked in me a new dimension of appreciation for Shakespeare. [John] I suppose it didn’t hurt that for a time, Hamlet wore a David Bowie t-shirt, Guildenstern had on running shoes with his tux and Horatio wore a plaid shirt while carrying a canvas backpack. Obvious subtleties that brought through an awareness of drama occurring throughout generations and helping one understand that family is complicated regardless of the era and location. We are born of specific times and certain experiences whether wished or disregarded. We react and plan and react again. We question and accuse, reflect and question some more. We live. In whatever way we choose and however we feel we must. We live.